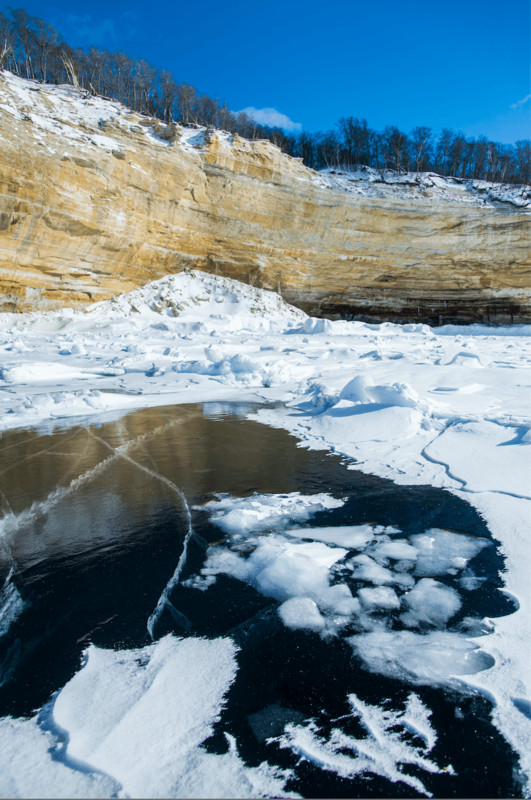 An epic winter on the shore of Lake Superior in 2014 turned the big water to big ice, and made ideal conditions for exploring the dramatic cliffs of Pictured Rocks National Lakeshore during a weekend campout. Featured in the February 2016 issue of Traverse Magazine. Get your copy. “A Review of the Historic Record Cold Winter of 2013–2014” … This is the name of a document put out by the National Oceanic and Atmospheric Administration about our beloved mitten state and the Great Lakes that surround it. With various weather maps and charts and weatherman speak, the official federal report explains that (my interpretation) something like a giant, surging, raging river of cold air set up between the Arctic and Northern Michigan that winter. The frigid air flowed southward, for months, creating the longest stretch of sustained cold weather ever recorded in many parts of our state. A satellite photo that accompanies the report is titled, “Lake Superior Reaches Maximum Ice Cover on March 5th, 2014,” and it shows, from that up-in-space vantage point, how the world’s most expansive body of fresh water looks when it’s 95.74 percent frozen. Not everybody would see camping in a record cold winter as an opportunity but for my friends Aaron Peterson, Jim Lively, Frank Skrocki and Hans Voss … well, that’s why they are my friends. We popped the van’s back hatch, slid open the side door and began hauling skis, snowshoes, sleds, snow shovels, backpacks, food and sleeping bags out into the fresh winter air. Our mission was to navigate north to Mosquito Beach campground, perched right on the frozen shore. Once there, we’d build a snow shelter called a quinzee for sleeping and then the next day wander the ice along the globally rare cliffs of Pictured Rocks. We wanted to see frozen waterfalls along the cliff tops and faces. 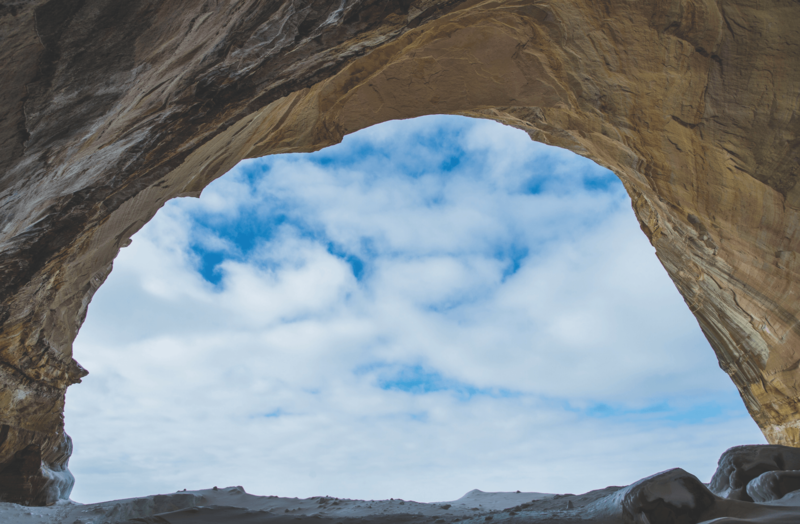 We wanted to see rock caves hung with delicate stalactites of ice crystals. We wanted to see the vast lake itself stretching forever to the horizon—crumpled, jumbled, crushed and refrozen. The trail was, for the most part, invisible—not too many travelers this time of year. So we headed off through the forest keeping eyes peeled for the little blue trail markers stuck into the trees. We got started a little later than we’d hoped, so by the time we dealt with one of the sleds tipping over multiple times and losing the trail a couple of times and finally abandoning the trail all together, it was late afternoon when we arrived at Mosquito Beach. Job one was building the quinzee snow shelter. To build a quinzee, you pile the snow, let it set for an hour or more and then carve a cave out of the solidified snow (like carving out the inside of a hardened snowball). We figured we’d pile the snow, eat dinner while it set up—a crystallization process called sintering—and then carve the cave. Photographer Aaron Peterson had brought his own tent, so that left four to dig the quinzee. Aaron was the most experienced outdoors person among us and the only U.P. resident. As he watched the men piling the snow and then looked up at the dwindling light, and considered his own knowledge of the quinzee work ahead, he said to me quietly, “Uh, do these guys know they are going to be digging out that quinzee in the dark?” “Their spirits are strong.” I said. “They’ll be fine.” And besides, they didn’t really know any better. None had ever built a quinzee. Two had never winter camped. For all they knew, everybody digs quinzees in the pitch black with headlamps. By about 9 or maybe 10 that night, with headlamps illuminating the brilliant snow-white interior, we crawled into a cozy, stout and spacious quinzee, and the feeling was not of fatigue and frustration, but pride and exhilaration at building such a fine winter shelter. The next morning we woke to a brilliant blue sky, calm winds and temperature around 5 or 10 degrees and getting warmer—ideal conditions for a day of exploring on the world’s biggest frozen lake. We finished breakfast of instant oatmeal, strapped on snowshoes or cross-country skis, packed food and headed out on the ice. Our day’s plan was simple. Trace northeast along the shore, be in no hurry whatsoever and seek things that awed us. All of this was easily achieved, especially the seeking awe part. That started the moment we stepped on the ice at Mosquito Beach. Looking northeast we saw the rock arch that shows up in a gazillion tourist photos of Pictured Rocks—but those photos are generally taken when the water is wet. The arch was spectacular with ice and snow all around. Just past the arch, we found a cave big enough for all of us to be in at once. We wondered at the ice stalactites that grew there. We slipped and slid on the slick ice-covered floor. We moved on along the shore. Above us, as we went, it seems the entire top edge of the cliff was draped in frozen waterfalls of one size or another. Some were stained brown by tannins and minerals, others glowed white. It was easy to understand why one of the nation’s longest-running ice climbing festivals happens here each winter. 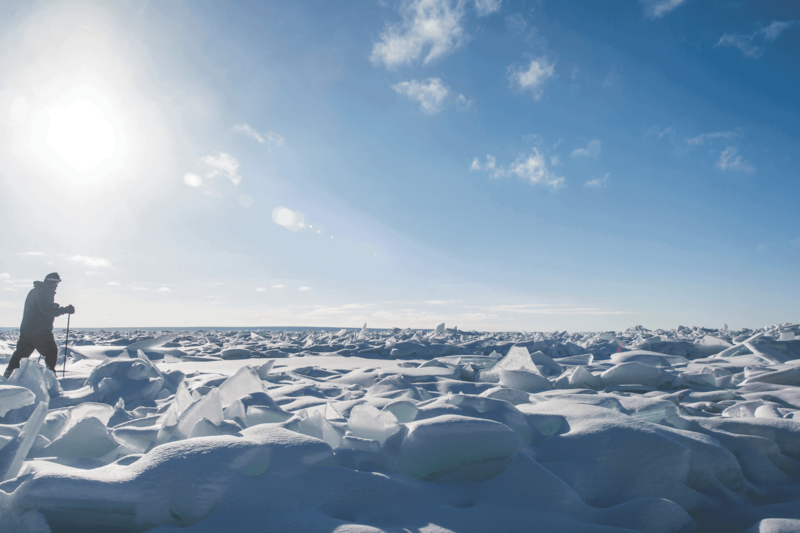 Out on the lake, one scene that endures is a gigantic pressure crack—a linear pile of ice, plates the size of conference tables, running to the horizon straight as a fence through a smooth expanse of frozen lake. Pressure cracks form as ice expands, eventually kind of exploding along a fault line—think earthquakes and plate tectonics. A few hours in, three of the guys wanted to head back. Aaron and I wanted to keep going. We split up. Aaron and I found more stuff to be in awe of—another big arch, some small caves, more ice waterfalls, more wondrously colored rock that gave rise to the name Pictured Rocks. That blue sky miraculously stayed blue all day, and the temperature rose to maybe 20. Glorious. The crew that returned told me later they just found a flat, elevated rock the size of a nice deck on the shore and sat in the sun, watching afternoon turn to golden twilight and just talking about life—an equally fine way to enjoy a winter day in a captivating place. I tell people that to thrive in winter, not just survive in winter, the key is pushing into it. Get some decent outdoor clothing. Get some snowshoes or skis. Get on out there. The body stays fit. The spirit lifts. Our journey to the Pictured Rocks shore proves all of that. 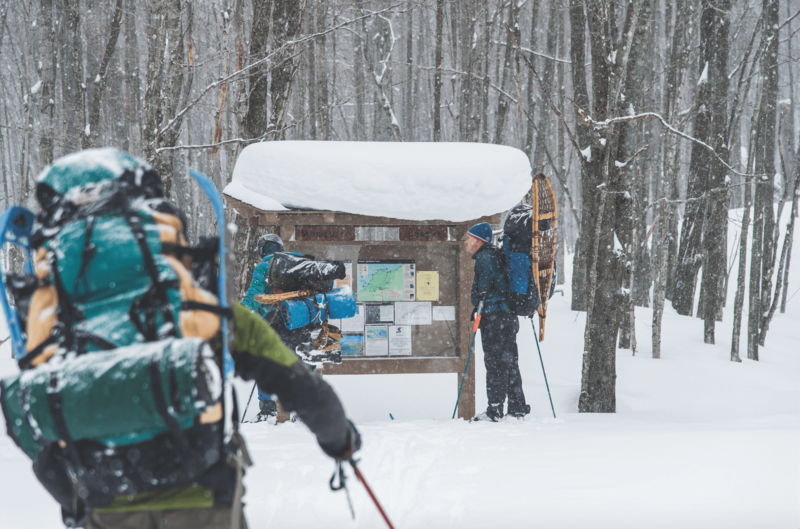 In the cold of the coldest winter, we headed to a raw and exposed Lake Superior shore and came back inspired by one of the most remarkable places in the natural world.